Adult & Pediatric Allergy Associates, P.C. By APAA Admin Team 18 Jan, 2019 Asthma, Children and Babies, Uncategorized Asthma Symptoms in Children, benefits of eating fatty fish, Children Asthma Symptoms and Diet, reduce asthma symptoms, reduce asthma symptoms in children, Why Are Fatty Fish Important in diet? Parents who would like to help reduce asthma symptoms in their children without medication, or additional medication, may be able to accomplish this goal through a change in diet. Parents may even be able to help prevent asthma in their youngsters with the right meal plan. Several studies confirm the benefits for children of eating plenty of fatty fish, vegetables and fruits, while avoiding unhealthy foods. Why Are Fatty Fish Important in the Diet? 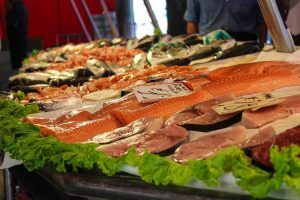 Some examples of these fish, also called oily fish, include salmon, tuna, sardines, herring and mackerel. They contain high levels of omega-3 fatty acids, which are recognized for anti-inflammation benefits for the cardiovascular system. These nutrients help prevent and manage heart disease. That’s a primary reason so many people take fish oil supplements. The American Heart Association advises people to eat at least two servings of fish, preferably oily fish, every week. Asthma symptoms are caused by inflammation in the airways that cause air passages to become narrower temporarily. With uncontrolled asthma, the person sometimes has difficulty breathing, with symptoms of wheezing, chest tightness and coughing. Patients generally carry rescue inhalers in addition to their other asthma medication in case they experience an uncomfortable, and perhaps severe, attack. Research published in the October 2018 issue of the Journal of Human Nutrition and Dietetics focused on the advantages of eating at least two servings of fatty fish per day for the anti-inflammation qualities. The children in the study ate a Mediterranean diet, which is known for a daily menu emphasizing vegetables, whole grains and fruit, along with a small amount of low-fat dairy foods, eggs and lean meat. After six months, the participants who had been eating the Mediterranean diet with two servings of oily fish per week experienced significant improvement in lung function compared with participants who ate a more standard diet. Authors of research appearing in PLOS One in 2013, from the Public Library of Science, looked at several studies focusing on how consuming omega-3 fatty acids affects the development of asthma. They found that children who consumed more omega-3 fatty acids had a significantly lower risk of developing asthma. However, this was not true for adults. An article published in the journal Nutrients in 2017 discussed the differences between the standard American diet and the Mediterranean diet, and how these types of eating patterns can influence asthma symptoms. The typical American diet is characterized by a high intake of numerous foods associated with increased inflammation in the body. These include red meat, processed meat, fast food, deep-fried food, high-fat food, sugary substances and refined grains like low-fiber bread and pasta. When parents realize their children are eating a relatively large amount of unhealthy foods, it’s time to make some major changes to the menu. They might try serving a different species of fatty fish each week so everyone can try the various flavors. A usual favorite can be served on another day. Boosting the intake of veggies, fruit and whole grains will be advantageous, and so will minimizing going to fast-food restaurants and serving too many foods with added sugar. 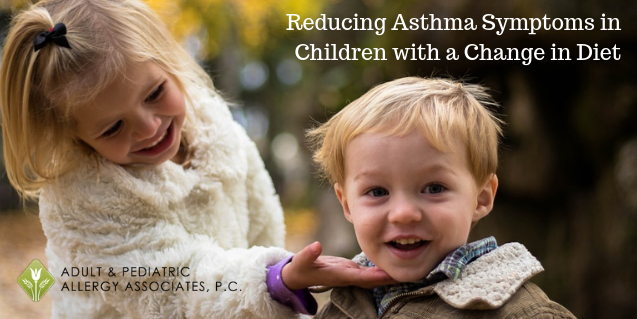 When children already have symptoms of asthma, their parents can seek diagnosis and treatment for these youngsters at Adult & Pediatric Allergy Associates in metropolitan Phoenix. Please note that this article is for education purposes, and does not constitute medical advice. Please see an asthma doctor or your PCP before changing medications or modifying your diet. Tired of dealing with asthma? EpiPen Update! Have you heard about AUVI-Q?